To use your existing Xbox One Kinect Sensor with a new Xbox One S or Xbox One X console, you'll need an Xbox Kinect Adapter. This adapter lets you connect your Kinect sensor to the Xbox One S or Xbox One X console. Note The Xbox 360 Kinect Sensor is not compatible with Xbox One. The Kinect sensor and Kinect Adapter ceased manufacturing in November 2017. Microsoft no longer carries inventory of the Kinect Adapter. Customers can check other retail stores for adapter availability. An offer for people with a Kinect sensor upgrading from Xbox One ended in March 2017. Plug the wall plug into the power supply. Insert the round connector of the power supply into the Kinect hub. 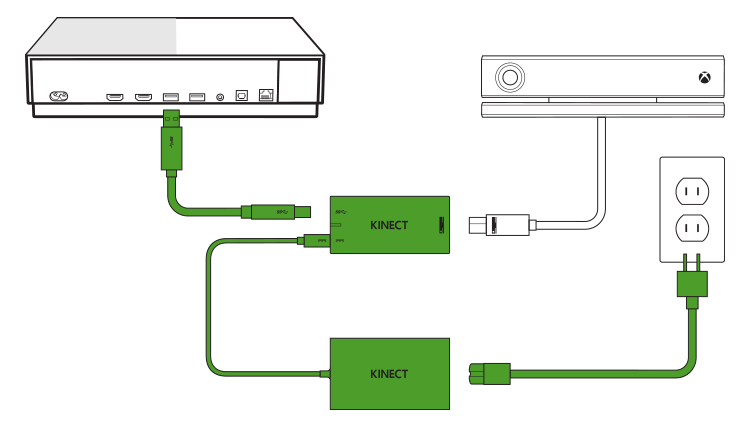 Insert the Kinect sensor cable into the Kinect hub. Insert the included USB cable into the Kinect hub. You're now ready to connect the adapter to your console. Insert the USB 3.0 cable into the left USB port labeled "Kinect" on the back of the console. Your Kinect sensor is now ready to be set up on your console. For best results, make sure your sensor and adapter are not sitting directly on top of your console. On your console, open the guide and select System > Settings > Kinect & devices. Select Kinect and follow the instructions to set up your sensor. Make sure the Kinect sensor is turned on in the console settings. Go to System > Settings > Kinect & devices > Kinect. Power cycle your console. Sometimes the connection between the sensor and the console needs to be reset. To do this, hold down the power button for 5 seconds until the console shuts down. Disconnect the power supply from the console and wait 1 minute before reconnecting and restarting the console. Check the connections of the sensor and adapter to make sure each connector is firmly attached. Make sure that the Kinect sensor and adapter are not placed directly on top of the console. The adapter must be powered to pass Kinect information to the console. Check the power supply of the adapter and make sure that the LED is lit. If you still have power issues after checking the power supply, reset the Kinect Adapter power supply by unplugging it for 10 seconds and plugging it back in. If the adapter power supply light is not lit, there's no power getting to the power supply. Try another outlet or replace your adapter, if trying another outlet doesn't work. If the power supply light is orange, this means that the adapter is in standby mode and is waiting for the console to respond. Power cycle your console again. If the power supply light is white, this means there is power, and the sensor is active. Power cycling your console should also fix an unresponsive sensor that has power. Would you like to contact Support regarding the "Using an Xbox One Kinect Sensor with an Xbox One S or Xbox One X console" issue you were reading about or a different issue?